An 18 year old recording with "Nasum" that most Nasum fans didn't knew existed was released as a 7" EP last week. Something for the die hard collectors to track down at once, because only 500 copies exists. I write "Nasum" because it's Nasum but it's not a Nasum recording per se. To be perfectly clear: It's Mieszko and I doing some Swedish death metal. The band was called Bloodshed and it was something we fooled around with for a few rehearsals in the early version of Soundlab Studios. I can't remember all the details but I guess it was born out of funny jams we had while rehearsing some Nasum stuff. All of a sudden we had some songs and made a three song recording. I played the drums and sung, while Mieszko played the guitar and the bass. When it was mixed I made a sleeve for the demo tape and we came up with a four piece line-up where only my name was the only real name. It was sent to a few fanzines and we made copies to anyone who were interested. Then we basically carried on with Nasum and finished the songs that would be the "Regressive Hostility" recording. Bloodshed was just a fun little project for a little while, nothing more. Until now. One of the few people that got the tape back in the 90's was Jonas Granvik who at that time made the fanzine Metalwire and sung in the death metal band Without Grief. A few years after the recording Jonas contacted me and wanted the lyrics for one of the songs as his band wanted to cover it. He raved about the demo and I found it amusing. Fast forward to 2013 and Jonas contacts me once again about Bloodshed. Currently he works for Sweden Rock Magazine and wrote to fact check a detail as Lawrence Mackrory from Darkane had spoken about the demo in a little feature. Jonas suggested that the recording needed to be put up on YouTube or something for the masses to hear it. That didn't happen. Almost a year later Jonas contacts me again and tells me that he's going to start a label and wants to release the Bloodshed demo as a 7" EP, and obviously I couldn't refuse the biggest fan of the band! I started to track down a master of sorts. I had a tape copy that was slightly distorted but knew there was a DAT-master somewhere. Once located I borrowed a DAT-player and plugged it in the computer only to realize that only one of the three songs remained on the master... Damnation! The whole thing was polished slightly by Dan Swanö while I put the cover together. In the spring of 2015 (!) everything was ready to go, but it took another six months to get the recorded pressed. Today I got it in my hand and it's as always quite a tingling sensation to hold a physical release that bears your name. I've loved it every time the last 25 years. 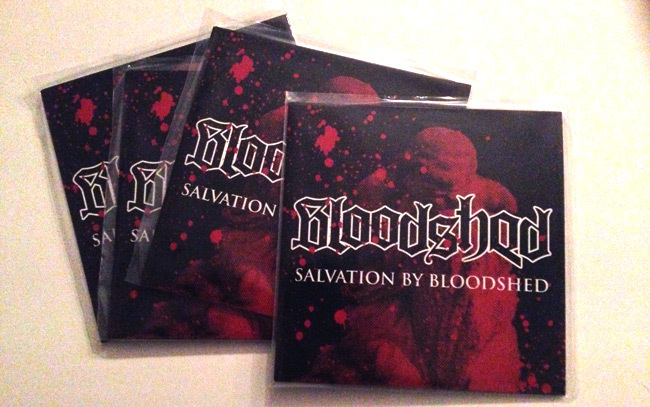 The 7" EP is released by Bone Records in 500 copies, 100 in red vinyl and 400 in black. The only way to get it right now is to write to bonerecordssweden@gmail.com.